Precision designed, easy to use, reliable knife maker to produce 38 mm (1-5/16") wide Ralph glass knives when used with EMS histology grade microtomy glass or any other 5.8 mm to 6.2 mm thick quality glass strips. This glass knife maker will automatically compensate for changes in thickness of the glass strips (typically 5.8 mm to 6.2 mm thick). Rugged designed, easy to use, reliable glass knife maker to produce 38 mm (1-5/16") wide Ralph glass knives when used with EMS histology grade of microtomy glass or any other 6 mm thick quality glass strips. These Ralph glass knives can be used on Rotary or Retracting Microtomes, for sectioning paraffin, JB-4 or methyl methacrylate specimen blocks. Please see the complete listing of Glass Knife & Ultramicrotomy Supplies. Embed tissue samples and create paraffin embedded tissue blocks efficiently, comfortably and without error. TEC-III Tissue Embedding Center is microprocessor controlled and built to provide years of reliable operation. Its 3-module design features a Dispensing console, Thermal console and Cold plate console. The low work surface with integrated paraffin block de-waxer, helps to speed up workflow. Technicians will appreciate user friendly membrane switches, the ample 5-liter paraffin reservoir, a heated dispenser nozzle, self-draining heated forceps holders and a cold spot. It includes removable base mold and cassette trays that are independently heated in their own compartments. The Cold Plate features a large, non-stick surface for cooling paraffin embedded blocks. Temperature can be controlled from 37 to -12°C. The unit features programmable operating times including automatic start and paraffin standby. All heated surfaces are independently controlled and range in temperature from 40 to 75°C. HistoPro® 200 offers unique reagent / paraffin infiltration capability with programmable processing time, temperature, agitation and vacuum in an easy to use, compact, cost conscious package. The Histo-Pro 150 offers superior operating convenience for tissue embedding processes in a modular ergonomic design. 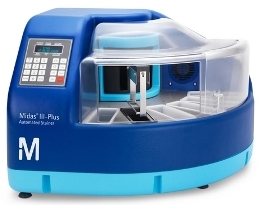 The Midas III-Plus Automated Stainer lets you automate all hematology and bacteriology staining applications. Since the unit is fully programmable, you can replicate your existing staining techniques to ensure consistent results for your peripheral blood and bone marrow smears, as well as your bacteriological smears. The Midas III-Plus Automated Stainer gives you the ability to automate all hematology and bacteriology staining applications. Since the unit is fully programmable, you can duplicate your existing staining techniques and ensure consistent results for your peripheral blood and bone marrow smears as well as your bacteriological smears. The Midas III-Plus Automated Stainer has a small footprint. Designed to perform routine hematology and bacteriology staining effortlessly, it uses the dip slide staining technique which ensures uniform staining for every sample and reduces stain consumption up to 50%. This versatile automated stainer combines the reliable electronics and mechanics of the original Midas III Stainer, now with a new optional plastic hood enclosure to make your laboratory a safer environment. Ideally suited for staining up to 1,000 slides per day, this stainer will become the new workhorse of your hematology/bacteriology lab. Available stations 6 stations: 4 reagent, 1 drying, 1 rinse. Option to turn drying and rinse stations into reagent stations. The EMS slide stainer offers the end user the ability to have a stainer with 30 stations and a continuous load option with multiple protocols. This state of the art stainer which is only 32" long has a built in fume extraction as well as the ability to connect to a lab fume hood. Programmable Flow Rates 500, 1000, 1500, and 2000 ml/min, programmable for individual step. HistoPro® 414 offers consistent staining of slides in an easy to use compact, cost conscious package. It is ideal for Mohs techniques, Special Stains, and general surgical pathology frozen sections. Automated Slide Staining for Low Volume Labs. 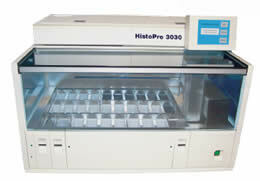 The Histo-Tek® SL provides reliable automated slide staining with countertop convenience. Able to stain up to 100 slides per hour, the Histo-Tek® SL eliminates labor-intensive manual staining while standardizing the process for optimal quality and error reduction. The Histo-Tek® SL features 15 programmable staining protocols with up to 35 steps each for maximum flexibility. Protocols can be saved and shared across multiple devices via USB drive for complete slide staining standardization.